Gregory Forbes (pers. comm.) reports that this species seems to occur widely in New Mexico, but can rarely be expected. Brickellia californica (T. & G.) Gray, Family Asteraceae. 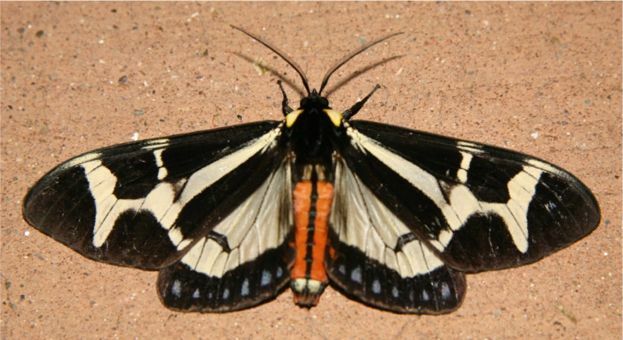 Flag Moth - A name coined for the subfamily Pericopinae by Hogue (1993) due to their large, boldly patterned wings. "During Howard's time in New Mexico, he was linked to University of Kansas entomologist Francis H. Snow. In August 1884, Prof. Snow and his students visited Silver City to collect insects (Cary & Holland 2002). Reporting on this expedition, Snow (1885:65) acknowledged "Mr. W. J. Howard of Silver City for many favors." Snow reported 13 butterflies and long lists of moths and beetles, remarking that the "electric lights at Silver City were very attractive to insects" (Snow 1885:69). 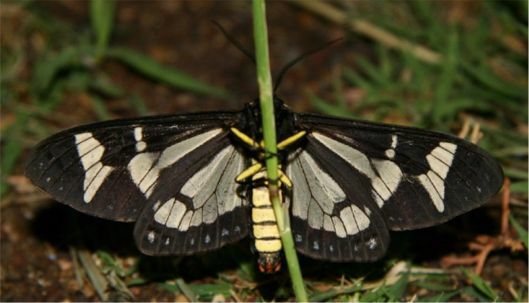 One particular moth was listed as "Daritis sp. a superb species obtained from Mr. W. J. Howard, Silver City" (Snow 1885:66). For identification of unfamiliar Lepidoptera collected on this expedition, Snow (1885:65) relied on Henry Edwards. 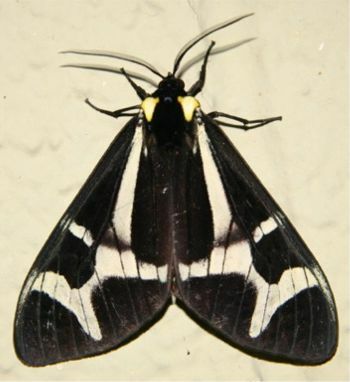 In describing the new moth as "Daritis thetis, Klug, var. Howardi" (Arctiidae: Pericopinae), Edwards (1886 : 165) noted that "About 2 years ago, I received from Mr. Wilson [sic] Howard, two specimens of this magnificent moth, which had been taken by him in New Mexico." Linkage of the type specimens from their collection by Howard, through Snow, to Edwards' description of D. howardi now warrants restriction of its type locality to Silver City, Grant County, New Mexico. No other patronyms were traced to Winslow J. Howard." Cary, S.J. 2002. Winslow L. Howard: pioneer New Mexico naturalist. Journal of the Lepidopterists' Society 56(2): 49-52. Cary, S.J., & R. Holland. 2002. Francis H. Snow's New Mexico butterfly collections. Journal of the Lepidopterists' Society 56(3): 151-161. Bethune, C.J.S., W. Saunders, E.B. Reed, and others. 1867. The Canadian Entomologist. Entomological Society of America, London. 244 pp. Druce, H. 1881-1900. Pericopidae. Pp. 105-112, In: Biologia Centrali-Americana. Insecta. 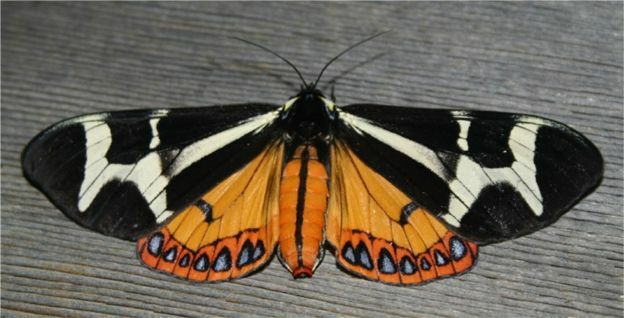 Lepidoptera-Heterocera. Volume III . R.H. Porter, London. Pl. 77, fig 24. pg. 395. Dyar 1900. Proceedings of the Entomological Society of Washington 4: 407. Edwards, H. 1886 . Apparently new forms of N. American Heterocera. Entomologica Americana 2(9): 165-166. Knudson, E. & C. Bordelon. 2003. Pub. 3: Checklist of Big Bend National Park. Texas Lepidoptera Survey, Houston. (treats 1300 species, 12 color plates). Knudson, E. & C. Bordelon. 2003. Pub. 7: Checklist of Davis Mountains, TX. 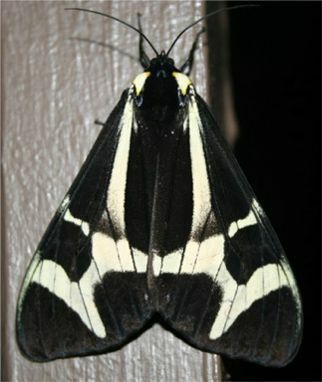 Texas Lepidoptera Survey, Houston. (treats 1100 species, 10 color plates). Snow, F.H. 1885. Lists of Lepidoptera and Coleoptera collected in New Mexico by the Kansas University scientific expeditions of 1883 and 1884. Transactions of the Kansas Academy of Science IX:65-69.